A dedicated fax machine and copier, the Oki OKIFAX 4100 is an excellent desktop companion in home offices. It uses laser print technology and offers a maximum copy resolution of up to 600x600 dpi. The Oki OKIFAX 4100 black and white fax has 16 greyscale halftones and it transmits faxes at a rate of 14.4 Kbps, which is faster than most dedicated fax units. However, the OKIFAX 4100 fax machine lacks printing and scanning functions, and it copies at a slow rate of 4 cpm. Measuring only about 12.3x15.3x7.5 inches, the Oki OKIFAX 4100 laser printer is very suitable for desktop operation. It sets up and troubleshoots easily, which means low maintenance, and it uses inexpensive consumables, keeping running costs at a minimum. The Oki 4100 fax machine features a 100-sheet document feeder, and a 30-sheet output tray, internal features include 56 broadcast stations, automatic redialling, alpha dialling, and transmit verification reporting. In addition to its small size, the Oki OKIFAX 4100 laser fax machine offers efficient media handling options and excellent output quality, thanks to its 600x600 dpi print engine. The Oki 4100 mono laser printer has an expandable memory, which can be maximised up to 1256 Kb, while the copier allows up to 50 copies in a single run. Buying recycled Oki toner cartridges for the OKIFAX 4100 is a good way to save money. However, the OKIFAX 4100 printer fails to impress when it comes to versatility in functions, as it is only limited to faxing and copying. More advanced fax units are capable of handling all document management tasks from printing to scanning, copying, and faxing. 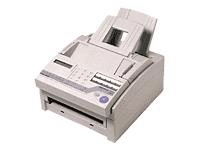 Nevertheless, the 4100 OKIFAX is a good choice for a dedicated fax machine and copier.